The Madonna of the Carnation, a.k.a. Madonna with vase or Madonna with child, is an oil painting by Leonardo da Vinci created sometime around 1478-1480 (Renaissance). It is permanently displayed at the Alte Pinakothek gallery in Munich, Germany since 1889 after it was in private ownership. The central (and centered) motif is young Virgin Mary with her naked Baby Jesus on her lap. Mary is seated and wears precious clothes and jewellery. With her left hand, she is holding a carnation (interpreted as a healing symbol. The faces are put into light while all other objects are darker, f.e. the carnation is covered by a shadow. The child is looking up, the mother is looking down — there is no eye contact. The setting of the portrait is a room with two windows on each side of the figures. Originally this painting was thought to have been created by Andrea del Verrocchio but subsequent art historians agree that it is Leonardo's work. Madonna and Child was a common motif in Christian art during the Middle Ages. 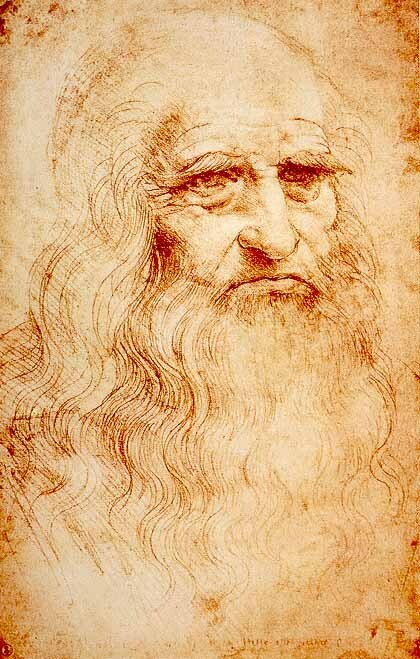 This painting is the only one of Leonardo's work which is permanently on display in Germany. This painting is a free variant of the Benois Madonna in the Hermitage, being more complex in its composition and spatial arrangement, though perhaps somewhat highflown and less spontaneous. How it arrived at the Alte Pinakothek in Munich, after its acquisition by a private German collector, is unknown to us. What is certain is that after a comprehensible, temporary attribution to Verrocchio or his shop, art critics subsequently almost universally assigned the painting to Leonardo, a judgement backed up by the most recent research. In fact, the richness of the drapery, the vastness of the mountain scenery with purple and gold hues tingeing the foothills of peaks that fade into the sky, the vitality of the cut flowers in the crystal vase and the softness of the Child's flesh that foreshadows the tender putti of the Virgin of the Rocks, are elements that show a distancing from the more distinctive Verrocchiesque style and instead assume those formal and chromatic characteristics that would be the mature Leonardo's very own. 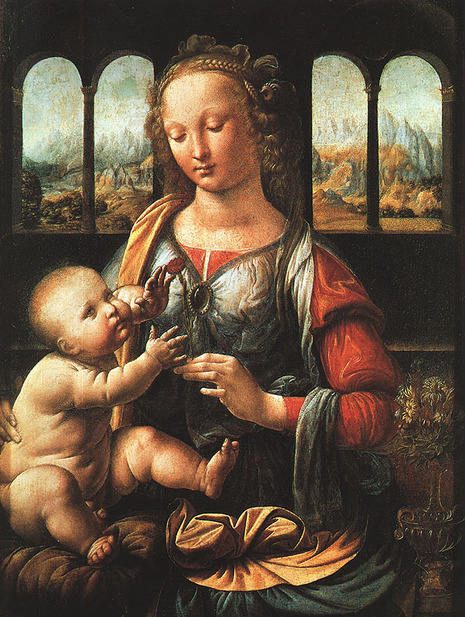 Moreover, we should not overlook the striking similarities - in facial features and other details - with the Benois Madonna already mentioned (the gem fastening the Virgin's gown over her breast) and with the Uffizi Annunciation, works that in their figurative and expressive invention quite clearly reveal the stamp of Leonardo.